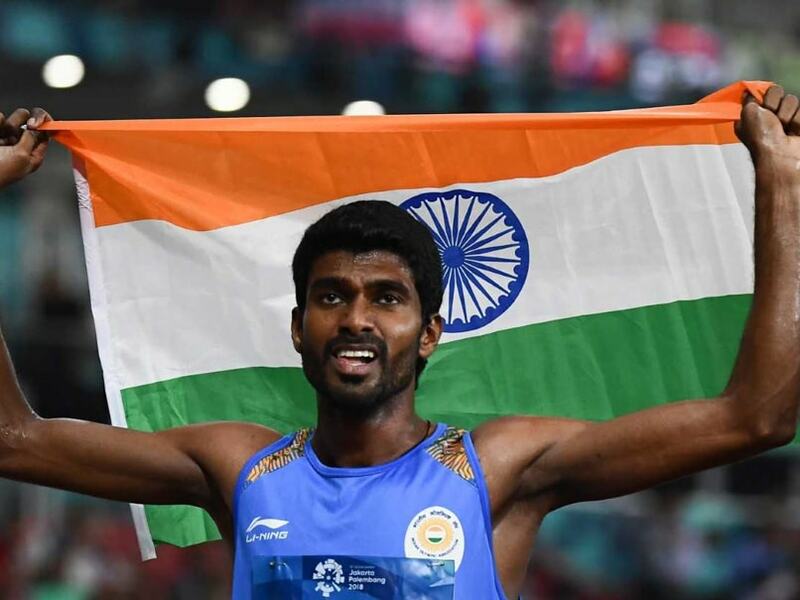 2018 Asian Games Highlights: Jinson Johnson clocked 3 minutes and 44.72 seconds to take the yellow metal. 20:24 IST: TABLE TENNIS: Manika Batra is through to the round of 16 with a 4-0 win against her Thai opponent. 20:10 IST: BIG NEWS! Pakistan lose their men's hockey semi-final against Japan. 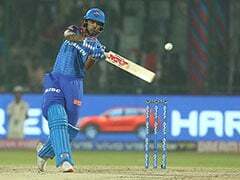 It's going to be India vs Pakistan in the Bronze medal clash for bronze medal. 17:15 IST: DISCUS THROW: Seema Punia throws 58.51 in her first attempt, jumps to No. 1 position in women's discus throw final. 15:58 IST: India vs Malaysia men's hockey semifinal match begins. 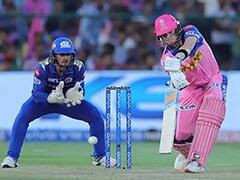 FOLLOW LIVE UPDATES HERE. 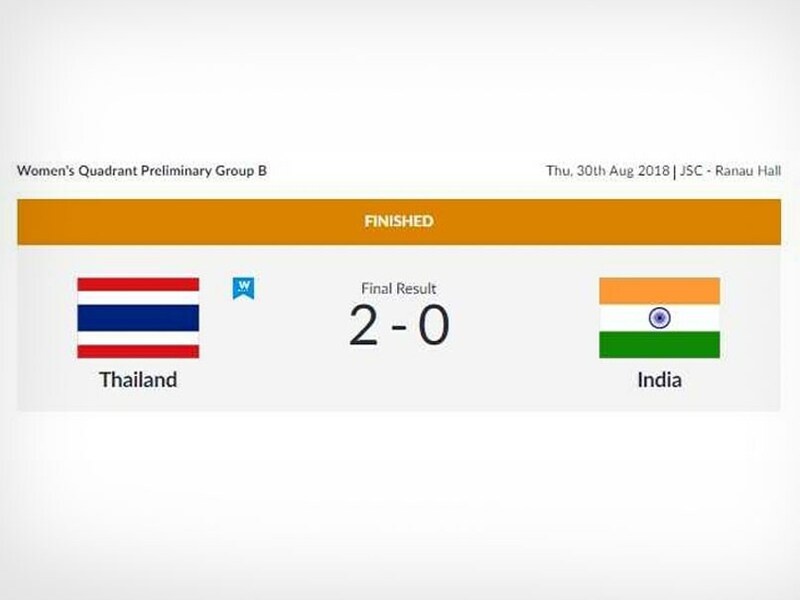 15:43 IST: In Sepak Takraw, India lose 0-2 to Thailand in women's Quadrant Preliminary Group B match. 15:25 IST: In Sepak Takraw, India trail Thailand 0-1 in Women's Quadrant Preliminary Group B match. 15:00 IST: In Cycling Track, India's Manjeet Singh finishes last in men's Omnium elimination race. 14:43 IST: In Equestrian, India's Zahan Kevic Setalvad and Kaevaan Kevic Setalvad finish in 24th and 36th place respectively in Jumping Individual Equestrian event. 14:24 IST: In Kurash, India's Danish Sharma loses 0-10 to Husein Misri of Kuwait in Men's -90kg quarterfinals bout. 14:20 IST: In Table Tennis, India's Sharath Kamal wins the third game 11-7 against Pakistan's Muhammad Asim Qureshi to lead 3-0 in men's singles Round of 32 match. 14:12 IST: In Table Tennis, Sharath Kamal takes a 2-0 lead in the men's singles Round of 32 match after winning the second game 11-8 against Pakistan's Muhammad Asim Qureshi. 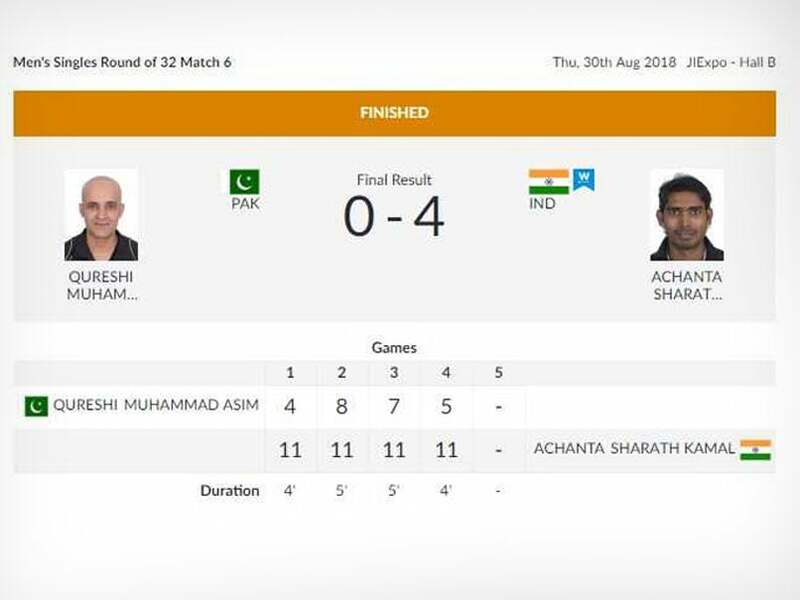 14:06 IST: In Table Tennis, India's Sharath Kamal takes the first game 11-4 against Pakistan's Muhammad Asim Qureshi in men's singles Round of 32 match. 14:00 IST: In Table Tennis, men's singles Round of 32 match between India's Sharath Kamal and Pakistan's Muhammad Asim Qureshi begins. 13:49 IST: In Kurash, India's Divesh loses 0-10 to Yakhyo Imamov of Uzbekistan in men's -90kg Round of 16 bout. 13:34 IST: In Kurash, India's Danish Sharma beats Mohanad Abueida of Palestine 10-0 to enter men's -90kg quarterfinals. 13:30 IST: In Squash, India lose 1-2 to Hong Kong in women's Team Pool B tie. 13:25 IST: In Kurash, India's Amisha Tokas loses 0-5 to Nguyen Thi Lan of Vietnam in women's -78kg Round of 16 bout. 13:15 IST: In Volleyball, India lose 2-3 to Myanmar in men's classification match. 13:06 IST: In Kurash, disappointment for India as Jyoti Tokas loses 0-10 to Mariya Lohova of Turkmenistan in women's -78kg Round of 16 bout. 12:52 IST: In Bridge, After semifinal 1 in men's pair, India's Sumit Mukherjee/Debabrata Majumdar is in second position, Subhash Gupta/Sapan Desai is in seventh position, Pranab Bardhan/Shibnath Sarkar is in 13th place. 12:49 IST: In Kurash, India's Danish Sharma beats Muhammad Dhifa Alfais 3-0 to enter men's -90kg Round of 16. 12:45 IST: In Squash, India pull one back to draw level at 1-1 against Hong Kong in women's team Pool B match. 12:43 IST: In Volleyball, India draw level at 2-2 after winning the fourth set 25-15 against Myanmar in men's classification match. 12:38 IST: Great start for India in Kurash. 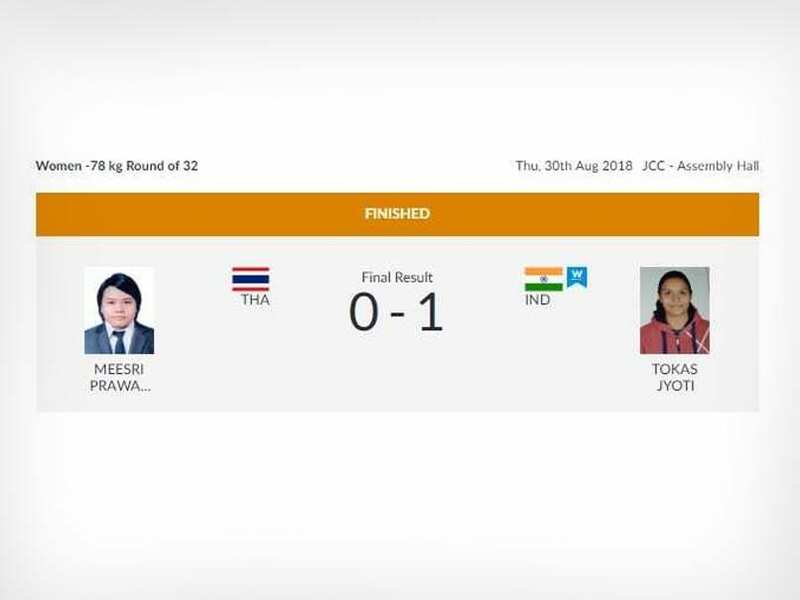 Jyoti Tokas beats Thailand's Meesri Prawanwit 1-0 to enter Women's -78kg Round of 16. 12:30 IST: In Kurash, Women's -78kg Round of 32 match between India's Jyoti Tokas and Thailand's Meesri Prawanwit. 12:17 IST: In Volleyball, India trail 1-2 after losing the third set 25-27 against Myanmar in men's classification match. 11:56 IST: In Squash, India trail 0-1 against Hong Kong in women's team Pool B match. 11:47 IST: In Volleyball, India take the second set 25-18 against Myanmar in men's classification match. 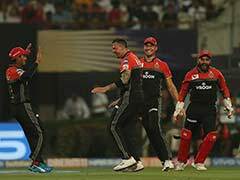 It is 1-1 now. 11:37 IST: In Volleyball, India are currently leading 14-9 in the second set against Myanmar in men's classification match. 11:23 IST: In Volleball, after leading 16-15, India lose the first set 21-25 in men's classification round match against Myanmar. 11:19 IST: In Table Tennis, India's Mouma Das loses 6-11, 5-11, 6-11, 6-11 to Chen Szuyu of Chinese Taipei in women's singles Round of 32. 11:11 IST: In Squash, Women's team Pool B match between India and Hong Kong begins. 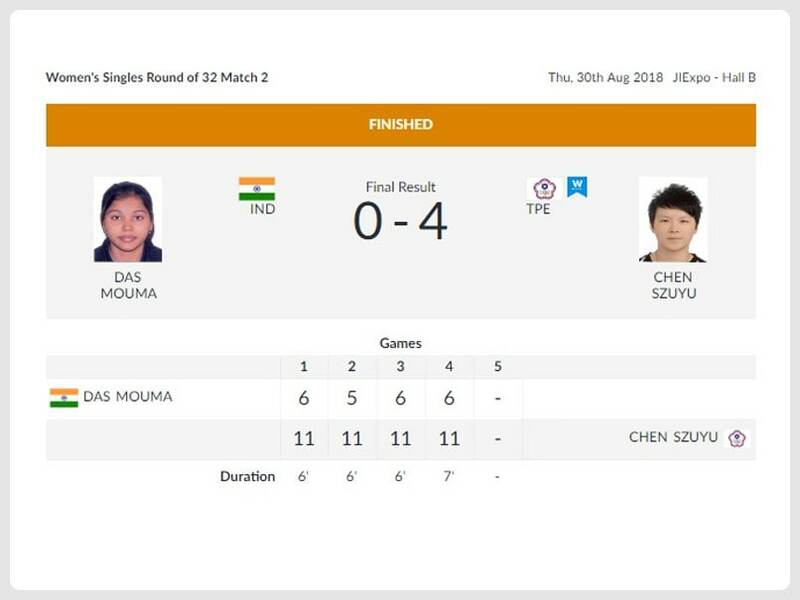 11:10 IST: In Table Tennis, India's Mouma Das loses the third game 6-11 to Chen Szuyu of Chinese Taipei in women's singles Round of 32, she trails 0-3. 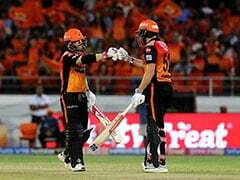 The third game also lasted for just six minutes. 11:04 IST: In Table Tennis, In Table Tennis, India's Mouma Das loses the second game 5-11 to Chen Szuyu of Chinese Taipei in women's singles Round of 32, she trails 0-2. Interestingly, the first two games last six minutes each. 11:00 IST: In Table Tennis, India's Mouma Das loses the first game 6-11 to Chen Szuyu of Chinese Taipei in women's singles Round of 32. 10:05 IST: In Cycling Track, India's Manjeet Singh is in 16th place after Temo Race in men's Omnium event. 09:54 IST: In Cycling Track, India's Chaoba Devi fails to qualify for women's 3000m Individual Pursuit final. 09:43 IST: In Cycling Track, India's Aleena Reji fail and Deborah Deborah fail to qualify for women's Sprint quarterfinals. 09:40 IST: In Equestrian, After Final Round 1 in Jumping Individual, India's Zahan Kevic Setalvad is in 30th place while Kaevaan Kevic Setalvad is 36th. 09:35 IST: In Judo, India's Garima Choudhary loses 0-10 to Gulnoza Matniyazova of Uzbekistan in women's -70kg elimination Round of 16. 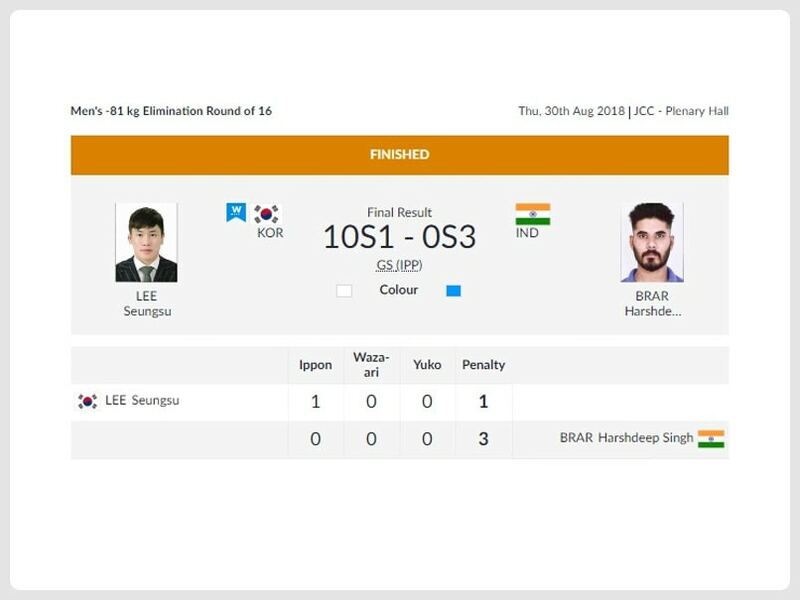 09:23 IST: In Judo, India's Harshdeep Singh loses to Lee Seung-Su of Korea in men's -81kg elimination Round of 16. 09:20 IST: In Canoe, India's Gaurav Tomar and Sunil Singh finish sixth in men's 1000m Double (C2) final. 08:53 IST: In Canoe/Kayak, India's Naocha Singh Laitonjam and Ching Arambam finish last in men's 1000m Double (K2) finals. 08:12 IST: In Judo, India's Harshdeep Singh beats Sri Lanka's Rajith Pushpa Kumara to enter men's -81kg Round of 16. 08:10 IST: In Cycling Track, India's Deborah Deborah and Aleena Reji qualify for women's sprint 1/8 finals. 08:07 IST: In Judo,India's Harshdeep Singh is up against Sri Lanka's Rajitha Pushpa Kumara in men's -81kg elimination Round of 32. 07:56 IST: In Cycling Track, India's Aleena Reji clocks 12.339 in Women's Sprint qualification. 07:50 IST: In Cycling Track, Women's Sprint qualification involving India's Aleena Reji and Deborah Deborah begins. 07:48 IST: In Cycling Track, India's Manjeet Singh finishes 16th in Men's Omnium Scratch race. 07:34 IST: In Cycling Track, Men's Omnium Scratch Race involving India's Manjeet Singh begins. 07:30 IST: In Kayak, India's Soniya Devi Phairembam finish last in women's 500m Single (K1) final. 07:17 IST: In Kayak, India finish last in men's 500m four (K4) final. Kazakhstan won gold while Republic of Korea got silver and Iran took home the bronze. 07:07 IST: In Athletics, India's Sandeep Kumar has been disqualified from Men's 50km walk. Arpinder Singh had a no jump off his first attempt but then set the ball rolling with a jump of 16.77 metres with his third attempt, which was good enough to get him the gold. 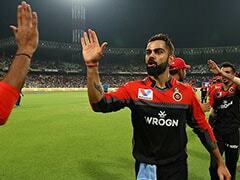 India had a fine outing on Day 10 Manjit Singh and Jinson Johnson had recorded a sensational 1-2 in the men's 800-metre. PV Sindhu won silver in the women's singles in badminton as Chinese Taipei's Tai Tzu Ying reiterated her dominance over the Indian. India also won silver in the 4x400-metre mixed relay, which marked India's 50th medal on the medal tally. The Indian men's table tennis team lost 0-3 to South Korea in the semi-final and took home the bronze medal. The women's and men's compound archery teams also added silver medals earlier on Tuesday.